B Strong Ride is a bicycle event that celebrates cancer survivorship and funds a complete year of cancer care at the Boulder Community Health Center for Integrative Care and also benefits the George Karl Foundation (GKF). Both organizations have deep personal impacts on people whose lives are impacted by cancer. Supporting them moves our riders and sponsors to super human efforts – even when battling for their own lives – including our top fundraiser and cancer survivor Dominic Scrivner. Boulder Community Health Center for Integrative Care (CIC) provides a wide range of services integrated with conventional cancer care that are clinically demonstrated to improve patients’ outcomes by enhancing wound healing, shortening hospital stays, and reducing pain medication needs, as well as lowering patient stress and anxiety. I became a patient at the Center for Integrative Care center 4 years ago after my radiation treatments, then last year after surgery to remove my cancer. Both times I felt very weak and debilitated from repeated treatments, and getting acupuncture helped my process of healing and recovery. These ongoing treatments at the CIC were only possible for me because of reduced fee offered by the foundation. - Ellen T.
I don’t know how my wife would have gotten through the last months of her life if it had not been for acupuncture. It was the only thing that relieved her headaches and made it possible for her to sleep. If only Medicare covered this vital treatment. The staff and this treatment provided relief when medicine could not. - Martin C.
As a cancer patient of BCH I am proof of the positive relationship between chemotherapy and the multiple components of integrative services of message, acupuncture and reiki. I now celebrate this wellness as a participant in the B Strong Ride. This community effort reaches far and deep! Thank you. 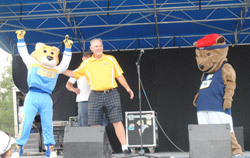 B Strong partners with NBA Coach George Karl and the George Karl Foundation. GKF is a catalyst of change, bringing together powerful partners to improve the cancer journey, beginning with educating people about cancer prevention to navigating the patient through treatments and ultimately to living healthy after surviving cancer. MyLifeLine.org, a nonprofit organization that provides cancer patients and caregivers free, customized websites. MyLifeLine’s mission is to empower patients to build an online support community of family and friends to foster connection, inspiration, and healing. Love Hope Strength, who turns concerts into lifesaving events. Through their GET ON THE LIST campaign they register marrow donors resulting in matches from concerts around the world. 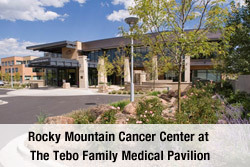 Through unique events, like Everest Rocks and Kilimanjaro Rocks, LHS builds cancer centers, giving people access to early detection and quality cancer care. Live By Living Foundation provides transformative outdoor experiences for cancer survivors and caregivers. LBL combines a physical challenge, the healing power of nature, and shared wisdom to help you regain your bearings, refresh your spirit, and restore your vitality. First Descents offers young adult cancer fighters and survivors a free outdoor adventure experience designed to empower them to climb, paddle and surf beyond their diagnosis, defy their cancer, reclaim their lives and connect with others doing the same. Starting in 2018, B Strong Ride partners with Camp Kesem at CU Boulder to support children impacted by a parent’s cancer. Kesem is a nationwide community, driven by passionate college student leaders, that supports children through and beyond their parent's cancer. Kesem's flagship program, Camp Kesem, operates free summer camps for children who have been impacted by a parent's cancer. Founded at Stanford University in 2000, Camp Kesem has since expanded to 116 chapters in 42 states across the country.